Thank you, Vincent Price, for a fun five days! Today begins the second block of this year's Project Horror, which I've decided to devote to movies about Cults & The Occult. There's some movies in this group that I'm really looking forward to! 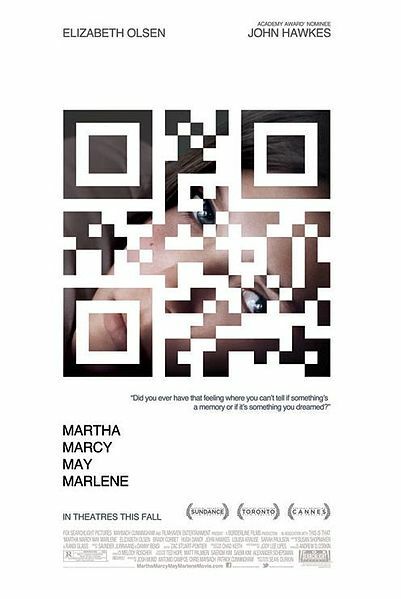 First up, Martha Marcy May Marlene. I can see this movie being divisive, because not everybody will like its very deliberate pace and ambiguous ending, but I thought that it just completely knocked it out of the park. It's not much of a nailbiter, and there's only one notably violent scene, but I already know that this is one that I'll be thinking about for a while. The movie stars Elizabeth Olsen in her first major role, although you may recognize her from cameos that she did in some direct-to-video movies made by her big sisters Mary-Kate and Ashley. No, really! She plays Martha, a vulnerable girl who escapes from an abusive cult in the movie's opening scene. Martha phones her sister from a nearby city, and goes to stay with her and her husband at their lakehouse. Although she's been missing for over two years, she'll only say that she's been living with a boyfriend in the Catskills. Instead of giving details all at once, the audience gradually learns about her experiences in flashback, which is so tightly interspersed with scenes from the present that you spend most of the movie a little disoriented. Eventually, we learn about the act that finally convinces Martha to flee from the cult, and why she remains so frightened. 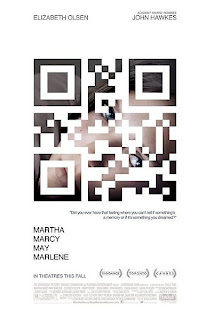 And really, Martha's fear is what this movie is about. From the time that she escapes the cult, she is constantly looking back over her shoulder, wondering if she's truly free. The fear for the audience comes from sharing the same uncertainty. We see Martha do something strange, or give an indication that she's unstable, only to find out in a flashback why she's acting that way. Watching this movie makes you swing back and forth between wondering if she's crazy and wondering if she really does know what's coming for her. There are so many finely observed details that I actually rewound several scenes more than once just to drink all of them in. Watching as Martha is gradually indoctrinated into the cult by the smooth manipulations of the leader is unsettling; seeing her turn around and help guide another new girl into the cult makes it downright chilling. Little details about the cult's daily life take on new significance and added menace when you find out more about their leader, particularly the kinds of children that he has. If I'm being frustratingly vague, I apologize. I'm really eager to talk more about this movie, but it's a recent enough release that I don't want to spoil it for you. It's in pretty regular rotation on cable right now, so see if you can catch it. Again, it's not a thrill-ride, it's a thinker, but I thoroughly enjoyed it. Elizabeth Olsen is not only incredibly beautiful, she's also very talented, and brings a lot to this role. I'm looking forward to seeing her in future roles. I give Martha Marcy May Marlene five black SUVs out of five. Tomorrow night: The Last Exorcism available on Netflix instant streaming. I watched this movie over the summer - mostly because I love John Hawkes. I thought it was so haunting - plus I loved you didn't know what was real and what was just in her head. So very good!